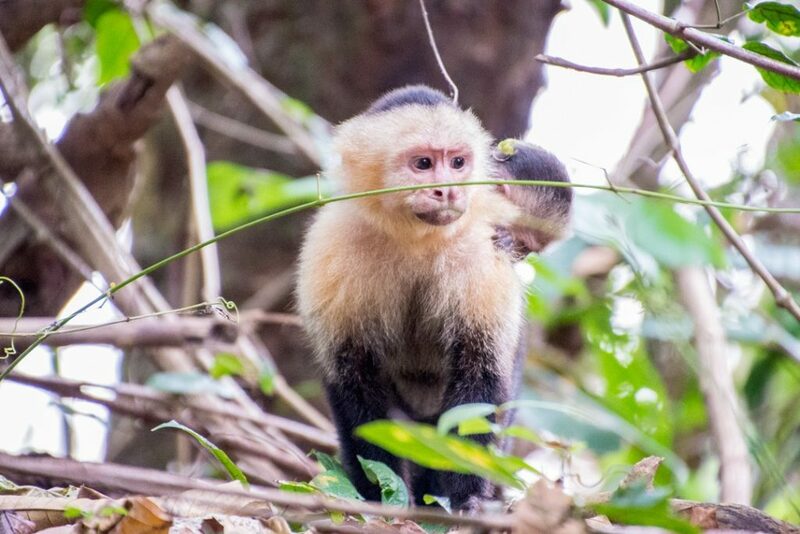 We were pleased then that our tour included a guided nature walk through Manuel Antonio National Park. 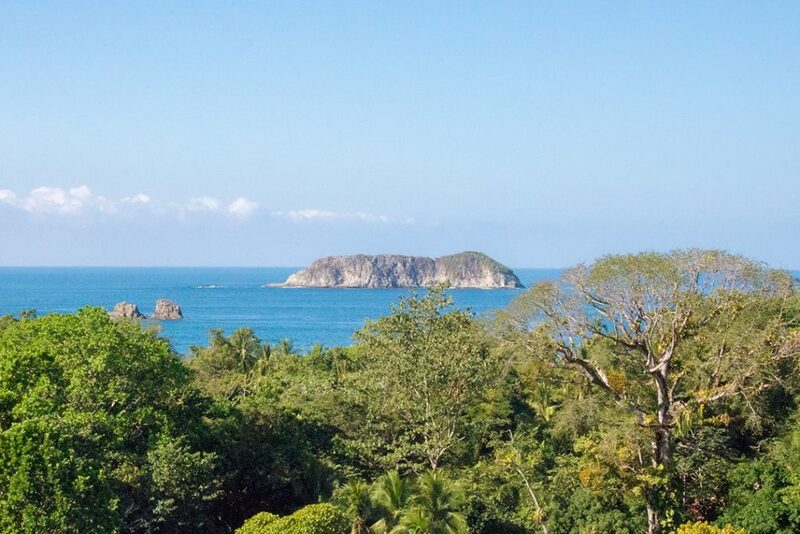 With its lush vegetation and picturesque perch by the Pacific Ocean, Manuel Antonio has been named one of the most beautiful national parks in the world. It also happens to be one of the best places to see sloths in Costa Rica. This rather odd animal has become a symbol of Costa Rica and even appears on the local currency. There’s something about the sloth’s perpetual state of languor that seems to chime with Costa Rica’s national mentality of ‘pura vida’ or ‘pure life’ that says everything’s cool, don’t worry, don’t fuss, don’t stress; just be thankful for what you have. 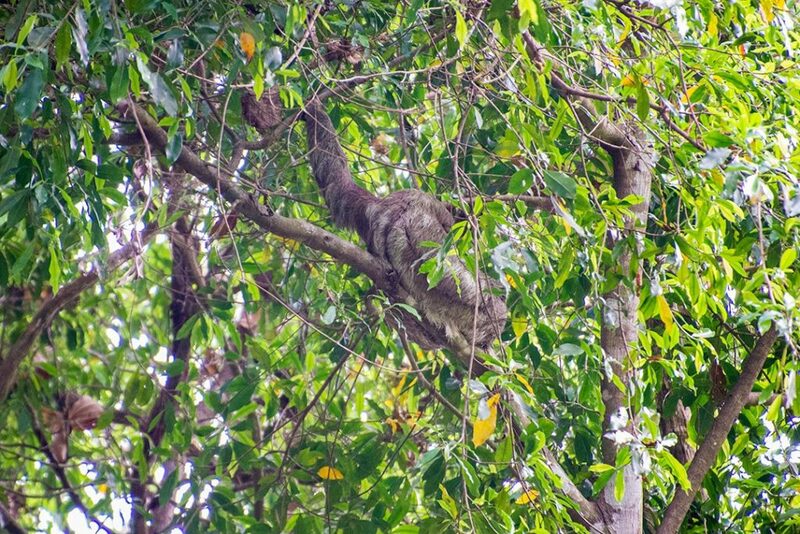 It’s fitting then that Costa Rica is home to two of the world’s six sloth species, namely the brown-throated sloth and the nocturnal Hoffman’s two-toed sloth. Sloths are common in Costa Rica but you’re unlikely to see them easily. Their slow movements and canopy-coloured fur mean you could walk past a tree full and not see them at all. With this in mind, we were joined by a certified guide on our search for sloths in Manuel Antonio. 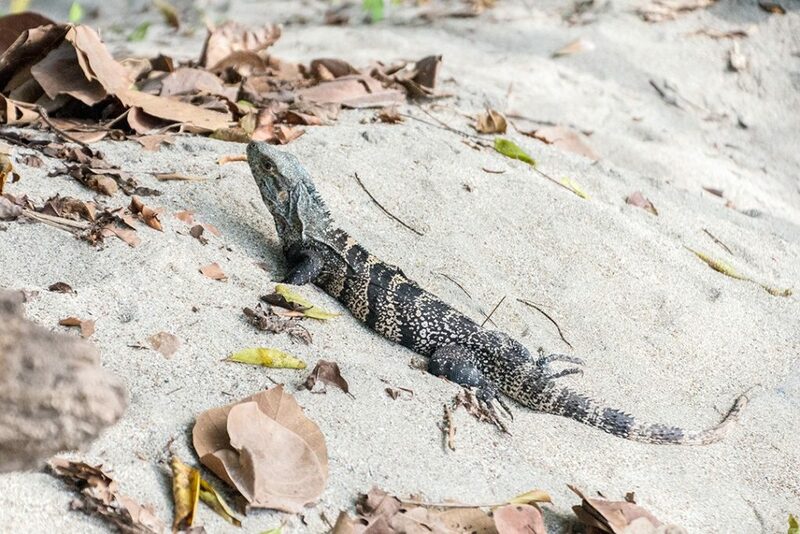 If you’re keen to see these lazy creatures, then a guide is absolutely crucial. They have finely-tuned skills and will supply a telescope to help you find other wildlife too. 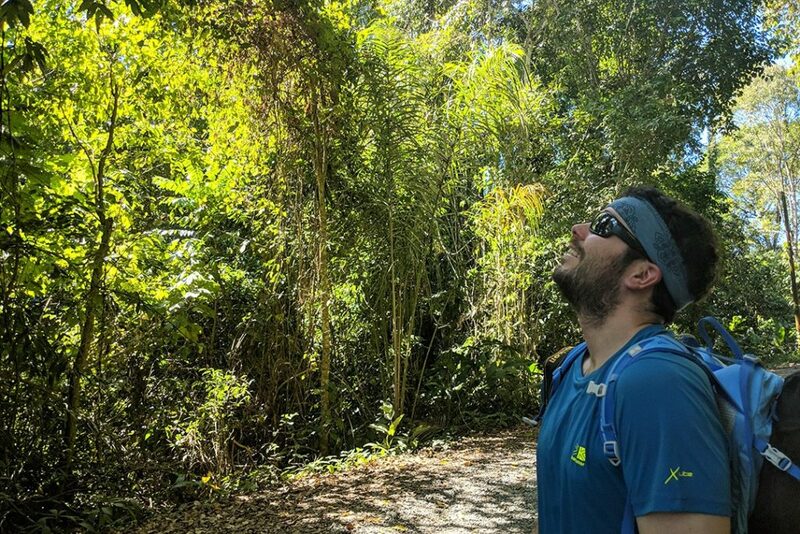 We met our guide, Johan, and embarked on our search for sloths in Manuel Antonio. In January, the air was warm but not oppressive, scented with vegetation and punctuated by the call of birds and monkeys. The park itself is well maintained with clear paths and boardwalks spanning its length. This does mean, however, that it never quite feels remote. 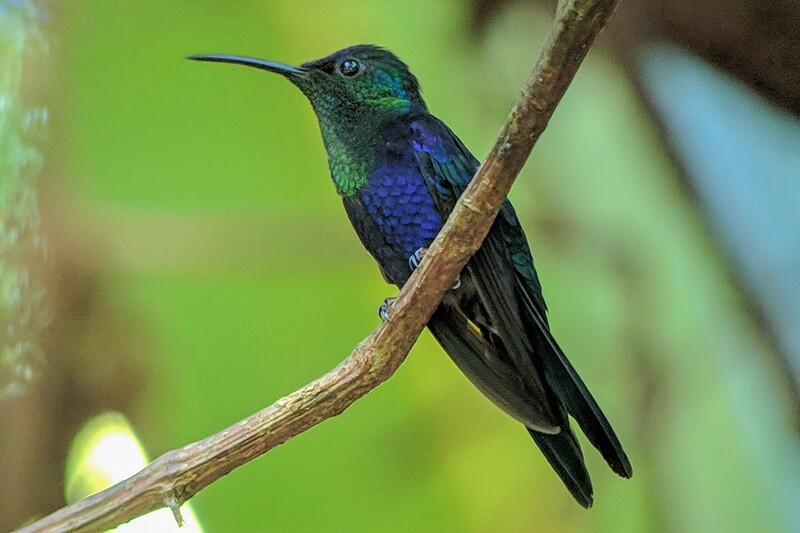 In fact, its burgeoning popularity has put pressure on park infrastructure, prompting Costa Rican authorities to implement tourism caps: 600 visitors at any one time on weekdays and 800 on weekends. These numbers mean that you’re sure to come upon other visitors, but a guided walk will help you spot things that others may have missed. 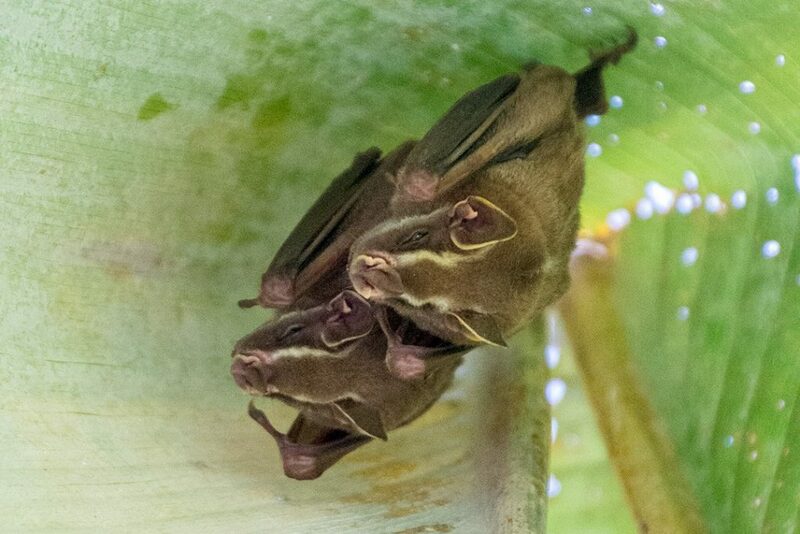 For example, as soon as we started our walk, Johan pointed out a pair of tent-making bats curled up underside a leaf. 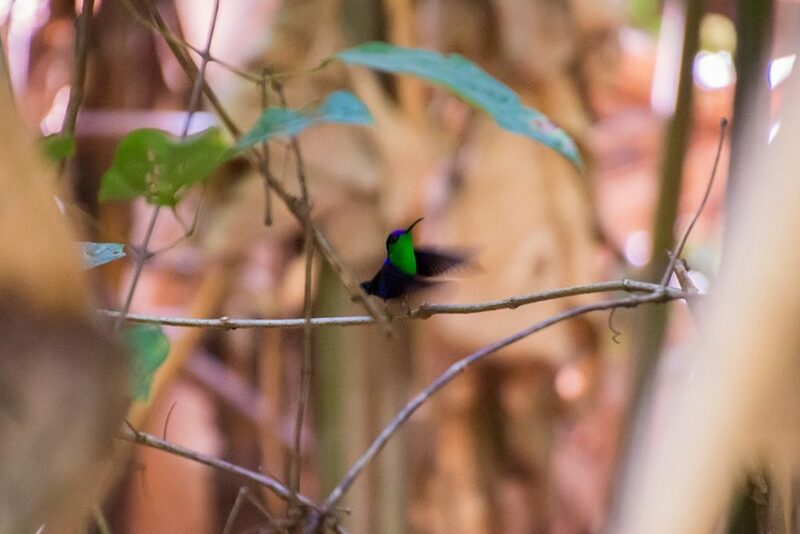 He also spotted a crowned woodnymph hummingbird who obligingly posed for photos. Shutterbugs should note that unless you have a telephoto lens, you may have to photograph the wildlife through a telescope. Most animals dwell high in the trees and are difficult to discern with the naked eye. We continued our search for sloths in Manuel Antonio. 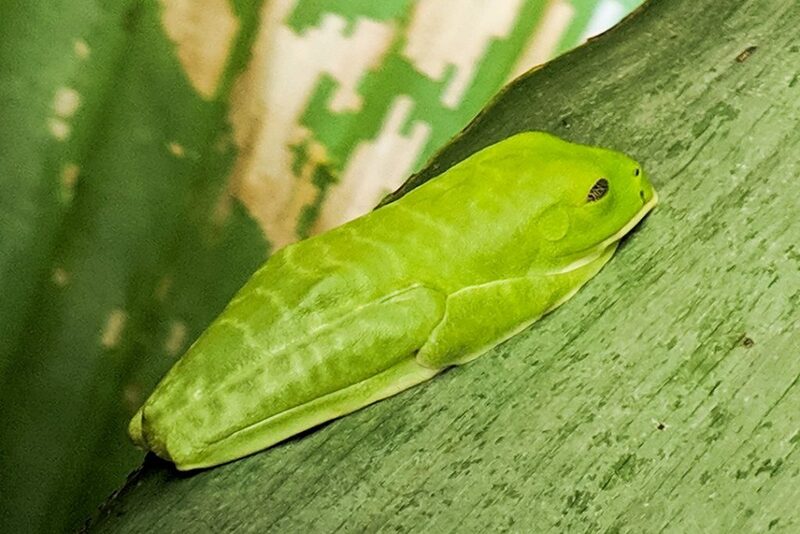 The creatures’ slow, infrequent movements and canopy-colored fur can be explained by a host of strange and interesting facts. For example, sloths are so slothful because they have the slowest digestion system of any mammal. It can take them two weeks to fully digest a meal. Instead of eating more, they have evolved to do less in order to conserve their energy. In fact, they can sleep for up to 20 hours a day. Sloths are natural tree dwellers and venture to the ground only once a week to relieve themselves. 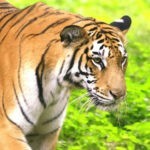 This is when they are most vulnerable to predators. It has to be said though: sloths don’t make for the tastiest prey. In wet season, a sloth’s fur becomes an entire ecosystem in and of itself with colonies of algae, fungi, mites and moths taking refuge there – up to 120 moths in fact! This lends the sloth a green tint that allows it to hide from predators and also serves to make it a rather unappetising meal. 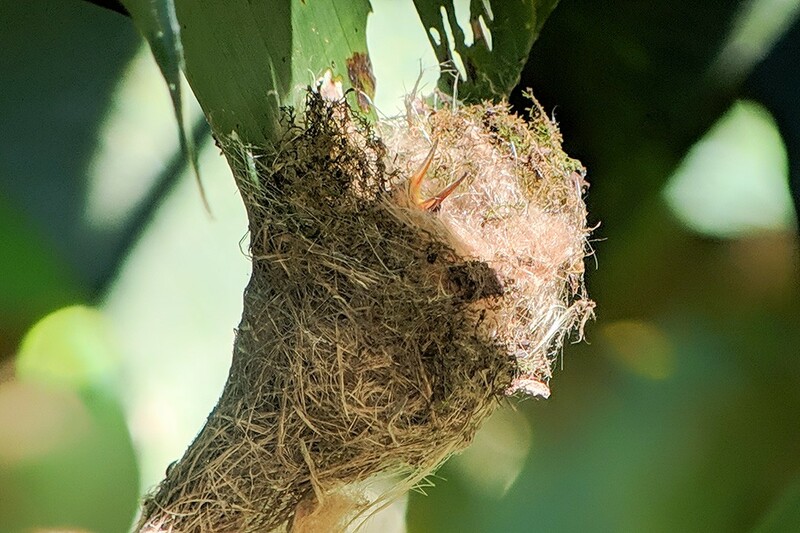 Thankfully, we visited in dry season when the fur is a cleaner, browner hue – as we witnessed halfway through our search for sloths in Manuel Antonio. If you are a keen photographer, consider dropping a pin in Google Maps and returning to the spot when the walk has finished. On average, sloths travel 37m per day – less than half the length of a football field – so you might easily find the sloth you pinned, in which case you can camp out and wait for it to shift to a pleasing angle. Naturally, you should never disturb one or try to make it move. Although we didn’t have the perfect view, we were pleased that our search was fruitful. Surprisingly, seeing sloths in Manuel Antonio wasn’t the highlight of our walk. Instead, it was this baby bird waiting for its mother in a nest. 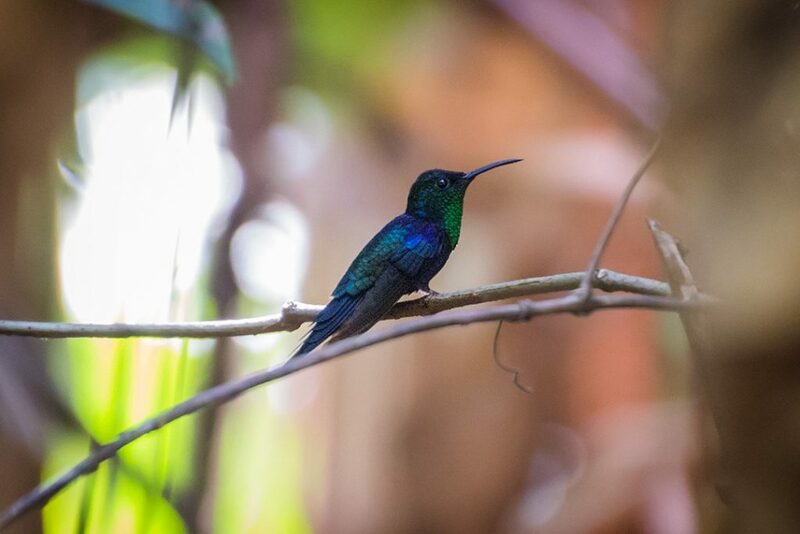 We saw a host of other animals including a red-eyed tree frog, an iguana and a howler monkey, said to be the second loudest mammal after the blue whale. After the walk, we strolled to nearby Espadilla Sur beach to swim in the Pacific Ocean and enjoy some of the famed pura vida that the sloths have mastered so well. 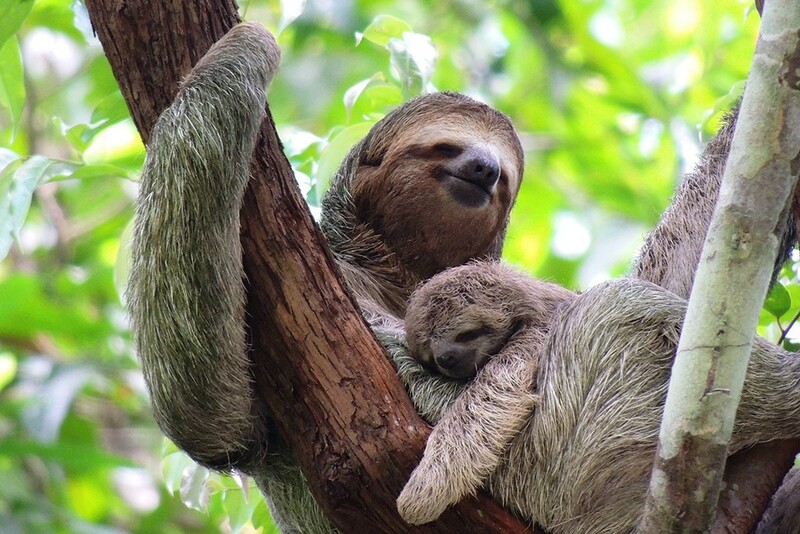 If travelling independently, book a certified guide to maximise your chance of seeing sloths in Manuel Antonio. There are food restrictions so check the FAQ before you pack your bag. Visit early in the morning to beat the crowds. Note that the park is closed on Mondays. Bear in mind that photography is difficult without quality lenses. Remember that you may not get a perfect shot of a sloth! After the main guided walk, consider some of the less trodden trails. Don’t stray from paths. 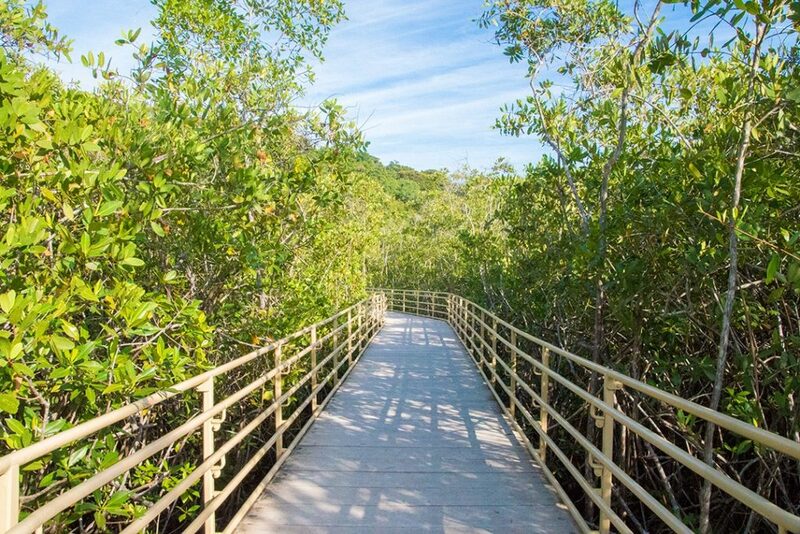 The boardwalks may instil a false sense of security so don’t forget that the park is full of wild animals. Pack your bathing suit and go for a swim afterwards. 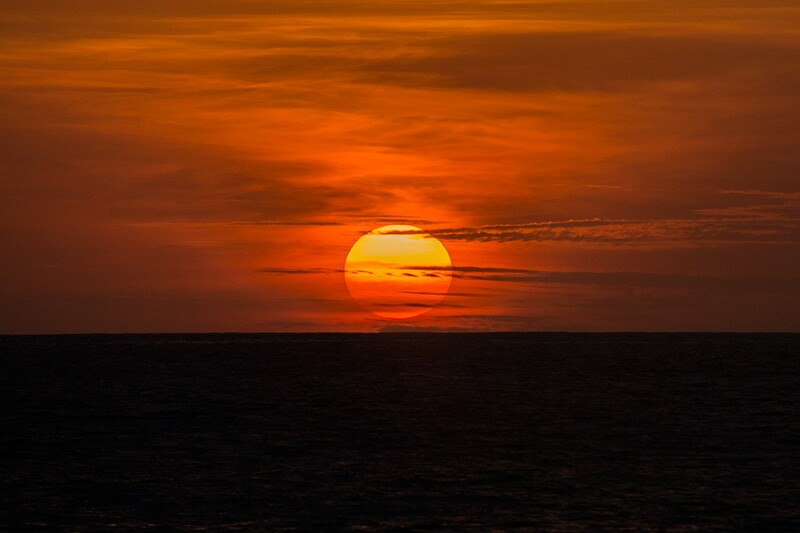 Most visitors camp down at Playa Manuel Antonio. Continue to Playa Espadilla Sur for fewer crowds. 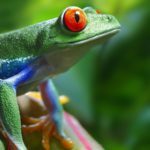 What: Searching for sloths in Manuel Antonio National Park as part of a 9-day Natural Highlights of Costa Rica tour with National Geographic Expeditions. 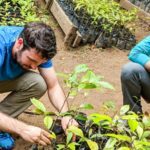 How: We joined a 9-day Natural Highlights of Costa Rica tour with National Geographic Expeditions, which includes a guided nature walk in Manuel Antonio National Park (closed on Mondays). 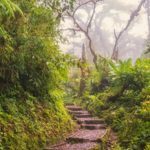 The tour itself is priced from £1,199 and includes a chief experience officer (CEO) throughout, all accommodation, transport between destinations, all breakfasts, some meals and numerous activities including a guided nature walk in Santa Elena Cloud Forest Reserve, learning to make tortillas from Doña Mara in her family home and a tour of Mi Cafecito coffee cooperative.